New Chinese government guidelines have called on the population to halve their meat consumption, according to The Guardian. The latest advice recommends that people should consume 40g to 75g of meat a day; the current intake is twice that. Although largely a public health message, the change has also attracted support from climate campaigners who hope it could reduce the impact of farming on the environment. China eats around 28% of the world’s meat – including half its pork – according to the OECD and FAO. 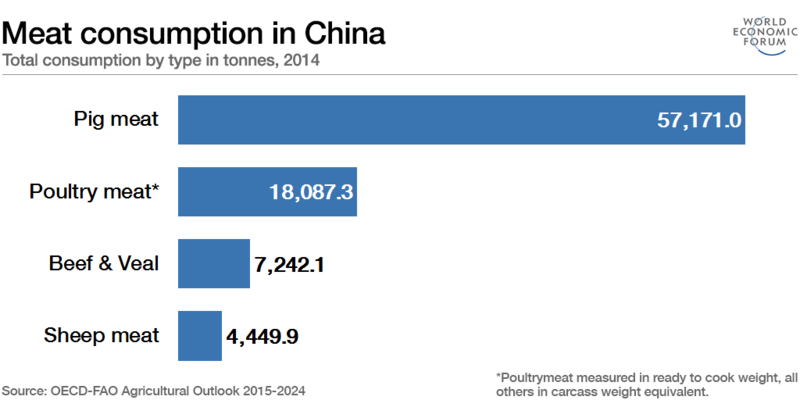 In total in 2014, the Chinese served up over 86,000 tonnes of meat. The new guidelines hope to see the level of per capita consumption reduced from the nearly 50kg consumed in 2014. The dietary guidelines are aimed at improving public health, but officials have also emphasised the environmental benefits of eating less meat. “Through this kind of lifestyle change, it is expected that the livestock industry will transform and carbon emissions will be reduced,” Li Junfeng, Director General of China’s National Center on Climate Change Strategy and International Cooperation, told The Guardian. And the move has found support in Hollywood. Arnold Schwarzenegger and director James Cameron lent their support to a WildAid campaign, urging the Chinese population to follow the new guidelines – for the good of their health and the environment. The impact of meat-eating on the environment is significant. The FAO estimates that domesticated ruminants (such as sheep and cows) release 100m tonnes of methane every year. In fact one study suggests that a shift toward a more plant-based diet (in line with dietary requirements) could reduce food-related emissions by between 29-70%. The results of their computer modelling are show in the chart below. However, in a World Economic Forum video, Professor Mark Post offers a novel solution – bioengineering meat in the lab, or even our kitchens. As he explained: “I know all the problems with meat-eating. But, I am a meat-eater and I will continue to eat meat.” So he came up with another solution.